The Rathfarnham woman finish fifth in her final outing of the Laser Radial sailing class at Weymouth. 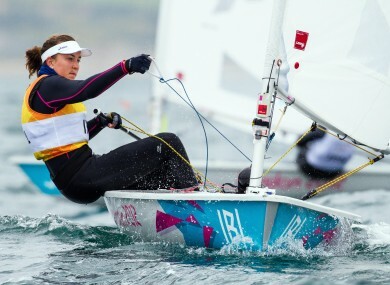 Annalise Murphy in action at Weymouth and Portland. ANNALISE MURPHY HAS narrowly failed in her attempts to take home a sailing medal at London 2012. Murphy got off to a fantastic start and was ahead of Belgium’s Evi Van Acker with two marks to go but fell back in the closing stages as she struggled to gain any speed heading down wind. Lijia Xu of China took gold, with Marit Bouwmeester claiming silver and bronze for Van Ecker. Xu got into an early lead and took the odd decision to head in-shore, something that dropped her down to third after Mark 1. Murphy led after the first mark but struggled to pick up wind at the second stage before positioning herself superbly to climb up to second at Mark 3. Xu, one of the lightest competitors in the race, was storming clear in the middle stages of the race, while Murphy dropped back to fifth. Bouwmeester had been in confident mood about her gold medal chances on Sunday but found herself in eighth place at the halfway stage. However she was not done yet and battled back up through the field, followed closely by Van Acker. Xu was nine seconds clear of Great Britain’s Alison Young with two marks to go, with Bouwmeester a second ahead of Murphy and Van Acker held up by fifth place Railey Paige. Murphy struck out alone, away from the chasing pack, but struggled to pick up speed on the downwind and was left trailing. Murphy’s brother, Finn, tweets from Weymouth after the race. Her performance was the best by an Irish sailor since 1980 but it will be scant consolation for the 22-year-old. She will hope to build on the experience and go one, two or three steps further at Rio 2016. Email “Annalise Murphy finishes fourth after medal race to miss out on Olympic glory”. Feedback on “Annalise Murphy finishes fourth after medal race to miss out on Olympic glory”.